I was once the biggest Cebu Pacific fan. I remember the first time I flew using my own money, years and years ago when I went with some friends to Cebu: I would not have been able to do it were it not for Cebu Pacific. A couple of years previously, flying--even domestic flying--had been the exclusive domain of the well-to-do. Back then, someone who wants to fly somewhere only had a choice between Philippine Airlines with its unreasonably high prices and legendary unreliable services (remember this? PAL = "Plane Always Late") and a couple of new budget airlines with a not-so-enticing reputation (remember this? "You fly an Asian, you land a Spirit"). Then Cebu Pacific came along and changed the local travel landscape. With its cheap and on time flights, the Gokongwei carrier opened the floodgates to the local tourism industry: flights-that-won't-kill-you had now become within the reach of the ordinary Juans and Juanas--mostly twenty- to thirtysomething young professionals who had the right mix of disposable income, vacation leaves, and thirst for exploration and adventure. Then, like any other enterprise that is worth its salt, Cebu Pacific decided that it wanted to grow. It sought a massive amount of capital to buy new planes and open new routes, and in October 2010 the investing public more than willingly (and, in hindsight, naively) supplied the firm with the financing it needed. So grow, the budget carrier did, and eventually Cebu Pacific was able to wrest the title of "the Philippines' number one flag carrier" from PAL. Unfortunately, the airline may have bit off more growth than it could chew. I first noticed that something might be amiss when I heard some of my friends here in Hong Kong swear that they would not fly Cebu Pacific anymore, that they would be willing to pay a premium for reliable services from someone else. I was puzzled when I heard this, I could not understand why anyone would want to pay more for something when Cebu Pacific can offer the same thing for less. That was until I experienced the reason first hand. In the past three months, I've traveled six times in and out of and within the Philippines, all with Cebu Pacific. Five out of six times, my flight was delayed. Three out of five times, my flight was delayed by more than an hour. One time, my flight back to Hong Kong had been delayed so much that I missed a very important appointment. 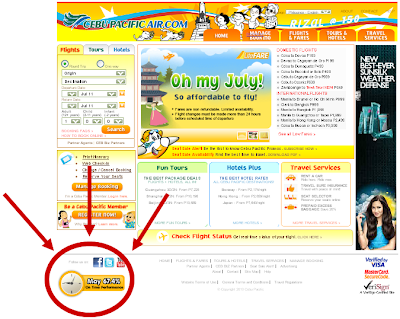 Understandably, I was so pissed, but at the same time I was wondering how Cebu Pacific's once very reliable service could deteriorate by so much in such a short amount of time, how the "on time performance" displayed on the flag carrier's website could go from a consistent 90+% to an embarrassing 60+%. I'm so sorry to hear that. I apologize in behalf of CEB. The "investor relations" reply to that issue is: "Our on-time performance has been affected by a new air traffic control system in NAIA. Aside from increased capacity from airlines, the new ATC system does not complement our fast turnarounds. We are working with CAAP to address this." The unofficial reply is: "Pinatalsik na yung @#$%^%& na foreign consultant na walang silbi. So things will get better. We want to keep loyal customers happy." But seriously, The ATC issue is real and affects not only Cebu Pacific but all carriers. We say we want growth but the Philippines ain't ready. Airport infrastructure pa lang inadequate na. And they want open skies? So the the heart of the problem is that Cebu Pacific has been unable to successfully address a systemic issue. 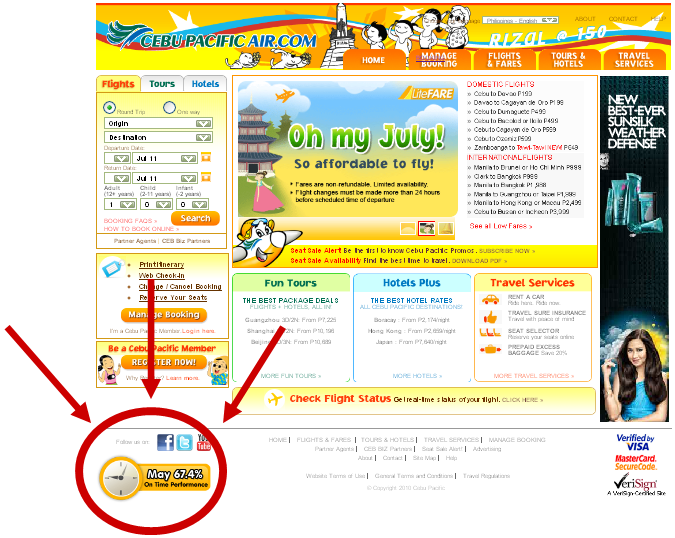 Regardless, the firm needs to take decisive and effective action soon if it wants to hold on to its number one status: it's not the only attractive pang masa alternative to PAL anymore--smaller but nimbler carriers like Zest Air currently pose a serious threat in the domestic market and Airphil Express has started to offer competitive no-frills international flights. I guess I'm willing to wait for things to turn around for the airline, but my patience is not without bounds; so unless Cebu Pacific improves it service in a sustainable manner in the foreseeable future, it will lose another loyal customer.